The Baking Biatch || by Cynthia Lim: Nara Thai, the place for Bangkok Street Food! 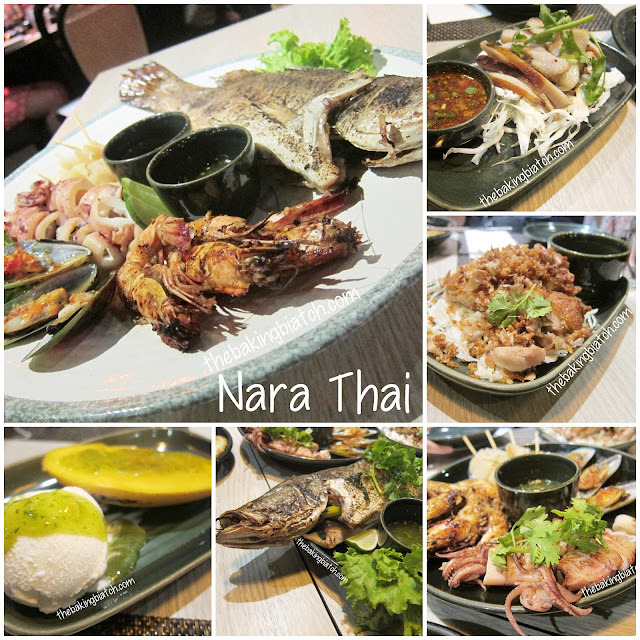 Nara Thai, the place for Bangkok Street Food! Last night, I had the honour of dining at Nara Thai, Ion courtesy of The Entertainer. I was busy with filming in the afternoon and was late for the dinner. #Sgeatwithus filmed a video for the making of these lovely Mango Tofu Cheesecake. I was starving at the end of the filming and was blessed with a good dinner at Nara Thai! The meal started with Barbecued Pork Neck with a tamarind dip.. this was really good. I'm not a fan of pork fats but I gladly ate this.. and enjoyed it! We also had crispy fried chicken with garlic.. I love fried garlic! We also enjoyed the Assorted Grilled Seafood Platter.. it was HUGEEEEEEEEEE. There was the grilled seabass, grilled scallops (really yummy! ), grilled prawns, grilled mussels and grilled squid. I like the dip that came with it.. it packed a nice punch without being too spicy! We had ours served in a smaller plate.. look at all that yummy food! The meal was accompanied by fragrant jasmine rice. The seabass was nicely grilled and it was a good portion enough to feed 4 - 5 pax! My ultimate favourite has to be the dessert. Imagine a good scoop of coconut ice cream coupled with a slice of mango that has been caramelised (like that of a creme brule!)... the caramelised part was to die for... It was topped with a lovely basil sauce that added a nice touch to the dessert. I'd gladly return over and over again for the dessert alone! Speaking of which.. The Entertainer is a membership that allows one access to many great deals all over the world. Locally, it allows users 1 for 1 deals in many restaurants and eating establishments across the island. It also offers 1 for 1 deals for spas... (I need this!) and hotels overseas.. You can view the membership details here: buy me! The hotel the hubby and I have booked for our trip next week is also in this list!!! A pity we have already made our bookings.. but then again, it's a sign..... a sign that we should travel more! They're also having a hot summer deal where you buy promotional rate hotel rooms.. buy 1 night and get another night free.. buy 2 nights at a hotel and get another 2 nights free.. or buy 3 nights and get another 3 nights absolutely free!